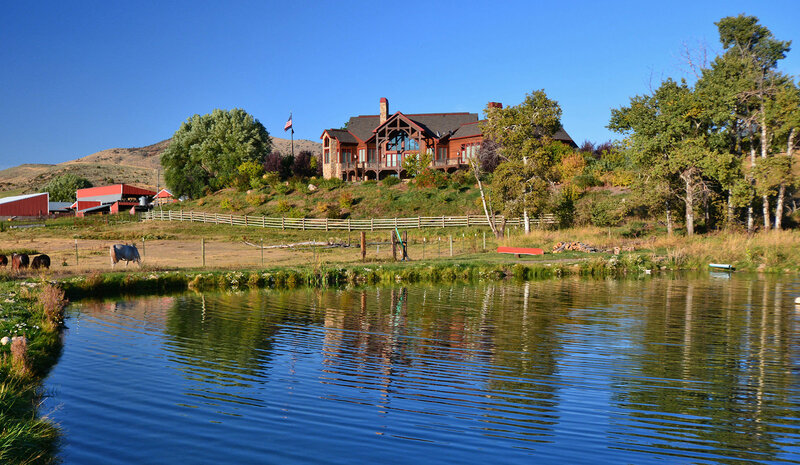 This 233-acre showplace, located two and a half hours north of Salt Lake City and fifteen minutes north of Preston, Idaho, offers a magnificent 7,500 square-foot custom home, completed in 2011, surrounded by lush lawns and beautifully manicured landscaping overlooking a spring-fed trout pond. The improvements also include a second house, which is well suited as a manager’s home, and well-designed ranch outbuildings and barns. The Ranch straddles a superior fishing stream – Mink Creek – which is supplemented by Strawberry Creek. 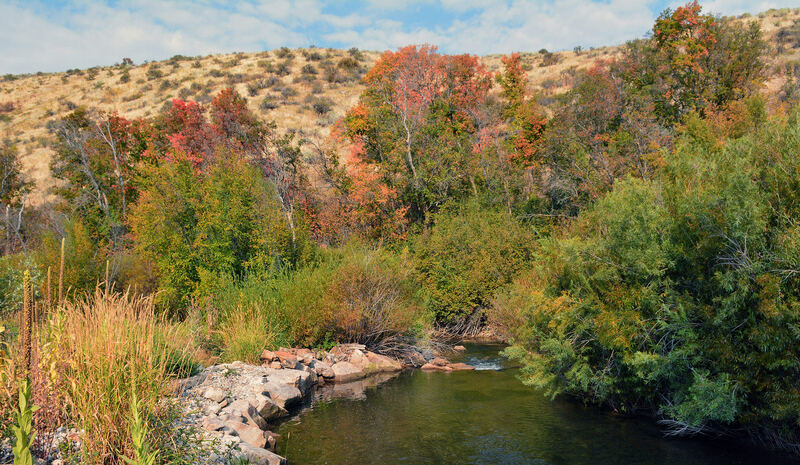 Mink Creek enjoys one of the most reliable flows in the entire Intermountain West. Several large free-flowing springs located at the head of the Creek generate large volumes of high-quality water running at ideal cool temperatures for trout. Mink Creek, which flows through the Ranch for about a half mile, has had substantial stream restoration enhancing the trout habitat. The stream is completely fenced in order to prevent any damage from livestock. The Ranch also enjoys excellent proximity to the Caribou National Forest which lends a wonderful recreational aspect to this easily maintained ranch. Over the past several years the Ranch has been dramatically and thoughtfully improved with the addition of the new owner’s home, a spring-fed fishing pond, stream restoration and new fencing. 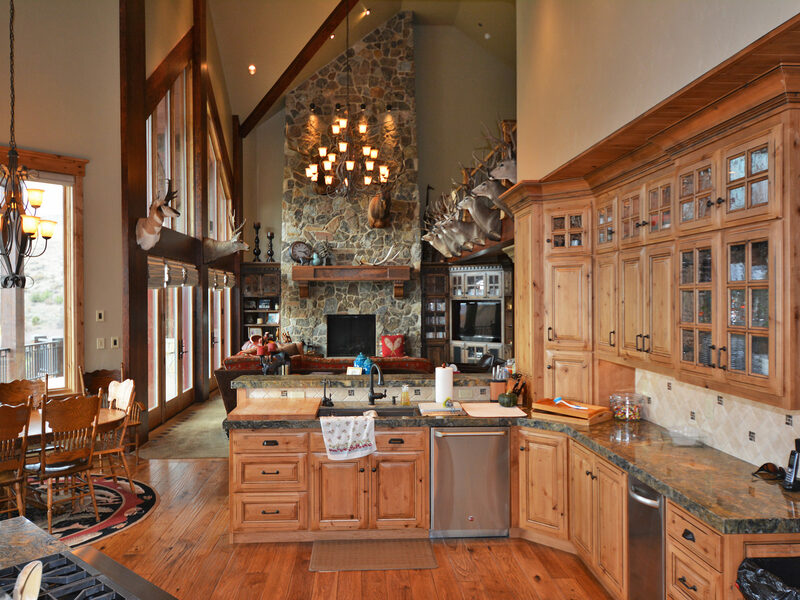 Historically, Two Creek Ranch has been utilized as a gathering place for extended family recreation and as a Registered Angus Operation that will run about 40 head of mother cows. The Ranch could also be leased to local cattlemen or run as a quarter-horse showplace. With its solid crop production, this small outfit could be completely self-sufficient. The Ranch is well watered with 130 irrigated acres including 2 new center-pivot sprinklers which were recently installed. 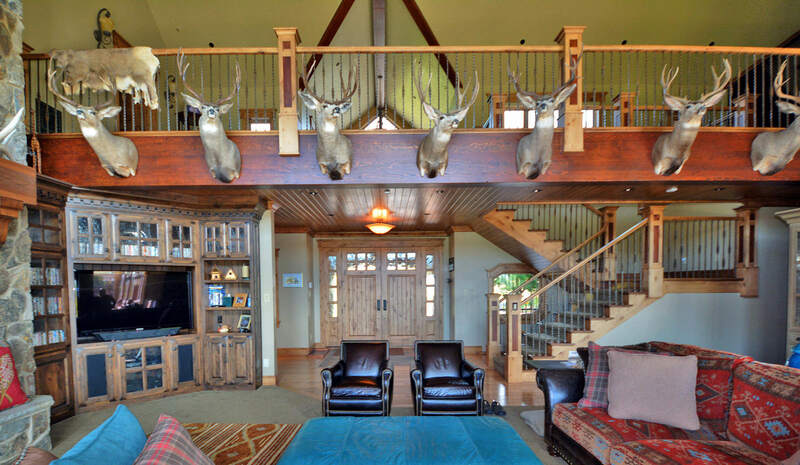 Two Creek Ranch, situated in an ideal Idaho location with spectacular improvements and abundant recreation options, presents an opportunity to purchase a beautiful legacy property. Two Creek Ranch is about 12 miles northeast of Preston’s downtown stoplight. Drive north out of Preston on Idaho State Highway 34. At the junction of Highway 36 just north of the bridge across the Bear River proceed 8 miles up Mink Creek to the Ranch. This route takes travelers past more historic wooden barns than any other road of comparable length in Idaho. Excellent commercial airline service is available at Utah's Salt Lake International Airport. Eleven major airlines provide service to the region, including Delta, American, Continental, and United which operate an average of 400 arrivals and departures daily. Preston, Idaho was settled in 1888 and has served as the trade and education center for the Northern Cache Valley. It remains an agriculturally-oriented town with a population of about 4,000. This clean, attractive community maintains beautiful parks, nice rodeo grounds, primary health care facilities and a good array of farm equipment dealers. Preston, only about 12 miles from the Ranch, is the county seat of Franklin County and offers a hospital, medical and dental clinics, three banks and several grocery stores. The stunningly-beautiful city of Logan, Utah is 45 miles away and still treats the farmer and rancher with great respect and appreciation. With a base population of nearly 40,000 supplemented by about 14,000 students at Utah State University, Logan provides social and cultural resources not found in many western agricultural regions. Many equipment dealers and suppliers provide excellent, competitive services and prices. A regional medical facility and established clinics provide additional health care resources. 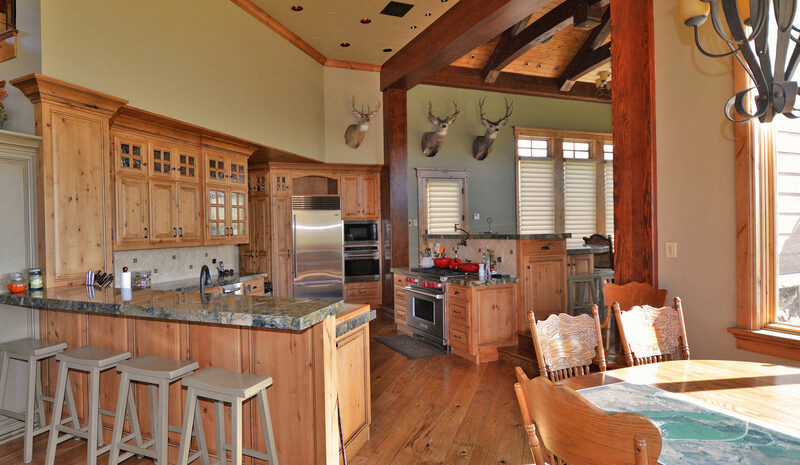 The improvements on Two Creek Ranch sit at an elevation of about 5,000 feet above sea level. The upper hillside pastures east of the highway range up to about 5,600 feet. 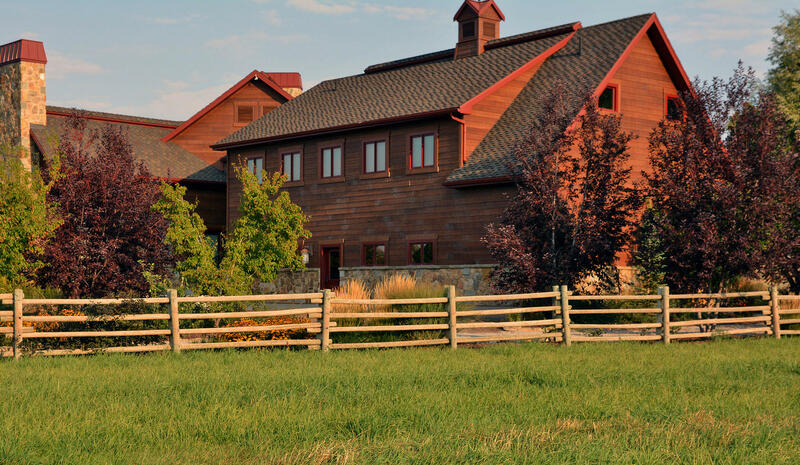 The Ranch enjoys a wonderful four-season climate with the clear low-humidity air which attracts so many to the Intermountain West. Summer days will range from 70 to 85 degrees Fahrenheit and there can be a cold snap each winter for 3 or 4 weeks with night-time temperatures at 25 to 30 degrees below zero. Monthly mean temperatures will range from about 20 degrees in January up to about 70 degrees in July. The average “frost-free” period usually begins about May 30 and ends about September 10th for an average of about 100 days. Typically, the Mink Creek Valley receives about 18 inches of annual precipitation. Fortunately, about 8 to 9 inches falls from March through June. 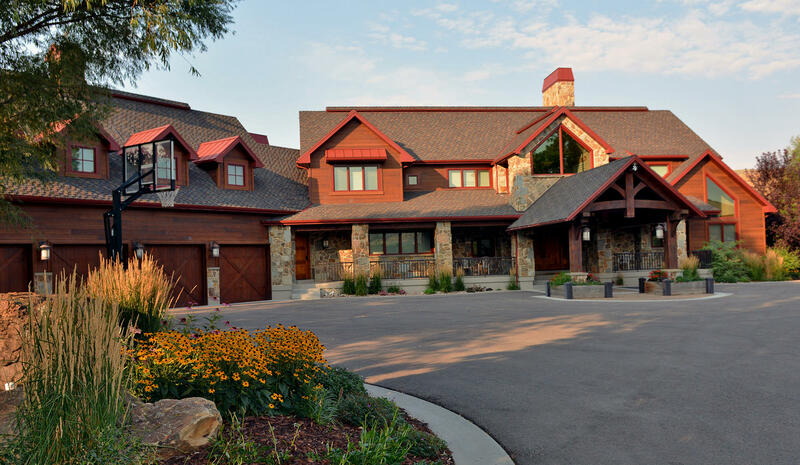 This architecturally-designed showplace is a spacious 7,500 square foot custom home offering an excellent layout for entertaining or hosting a large group. Features include a master suite on the main floor with vaulted ceilings, separate sitting room, fireplace and access to the large deck with breathtaking views. The gourmet chef kitchen is equipped with top of the line stainless appliances, granite countertops, a breakfast nook and beautiful cherry cabinets. 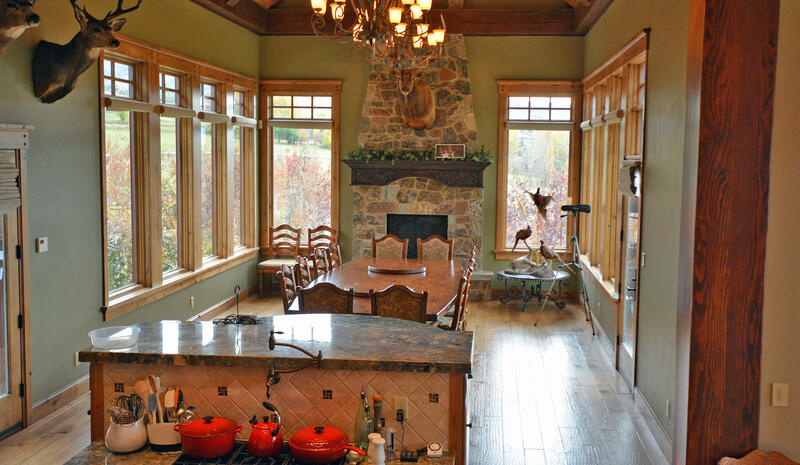 The formal dining room just off of the kitchen is surrounded in windows, and contains a beautiful rustic chandelier and a floor to ceiling stone fireplace for an intimate dining experience. 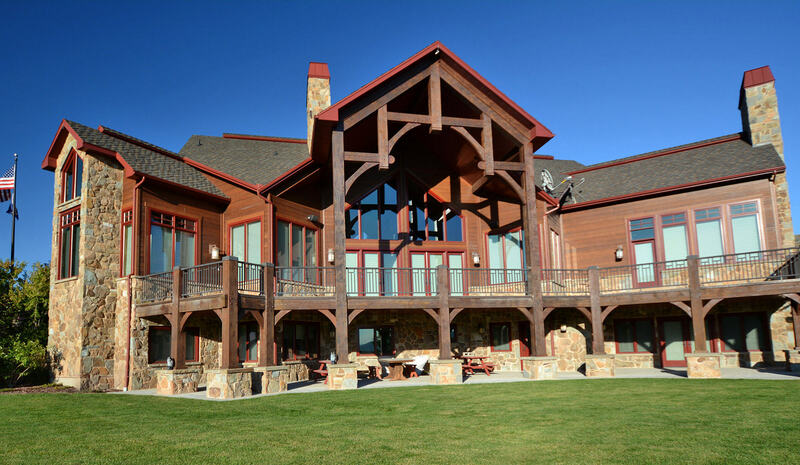 With hardwood floors throughout the main floor, the great room contains a wall of windows, an immaculate stone fireplace, soaring vaulted ceilings and a built-in entertainment center. The outdoor deck offers breathtaking views for entertaining. Upstairs, the breezeway overlooks the great room and leads to additional entertaining areas complete with a pool table and poker table. The lower walk-out level is comprised of four en-suite bedrooms, a large bunkroom, two bathrooms and a dedicated outside entrance onto the large commanding covered patio. The grounds surrounding the home are beautifully manicured and thoughtfully designed. Surrounded by mature trees, with ornamental plants, grasses, and landscaping rocks incorporated into eye-catching flower beds, the fully-irrigated landscaped lawn contains spaces ideal for relaxing, outdoor recreation and entertaining. The home also has a spacious four-car garage with plenty of space for vehicles and recreation toys. The shop and machinery storage facility is a 40' x 56' metal building with a cement floor, a wide service door and well-planned repair shop and storage bins. The well-designed 32' x 36' horse barn has four spacious box stalls, a tack room, a rodent-proof feed storage room and a rough-finish cement drive-through cleaning alley. The barn also has an insulated and heated office. There are multiple buildings utilized for machinery and hay storage. A 30' x 80' metal storage building structure with steel beams was recently built. A 30’ x 105’ storage facility is a wooden post structure which is in good repair. A 30’ x 50’ wooden post structure built around 2010, is primarily used as a hay storage building. The covered feed bunk building is 30' x 105' and adjoins the above-described building which has a concrete manger for 50 head of cattle with a concrete apron and an adjoining 40' x 100' metal loafing shed with steel beam construction and a cement foundation. The manure-storage bunk is a 40' x 50' concrete receptacle with steel-reinforced walls and floor. The well-designed set of livestock-handling facilities is in good repair and must be seen to be appreciated. The pens have two frost-free automatic livestock-watering fountains. The chute is well designed and very functional. There are also three small buildings inside the corrals. The 100' x 300' riding arena, which is fenced with pipe and cable, has well-maintained sand footing ideal for training. An additional 12' x 12' timber-framed building with metal sheathing is utilized for storage. Two metal granaries with cement floors appear to be in good working condition. There are also two 500-gallon gas tanks – one for gasoline and one for diesel fuel. This comfortable home, built in the early 1990s, contains about 2,000 square feet on two levels and a 2-car attached garage. The well-kept ranch-style house has four bedrooms with a full bath upstairs and a 3/4-bath downstairs. The nicely-maturing evergreen and quaking-aspen trees provide shade for the home which is surrounded by a well maintained lawn and nearby garden. The Ranch has 325 shares of water stock in the Mink Creek Irrigation Company, Ditch No. 1 and 41 shares in the Preston, Riverdale & Mink Creek Canal Company. It also has a 0.70 CFS (350 gallons-per-minute) riparian irrigation water right out of Mink Creek. The irrigated land is served by underground mainlines, two new pivot sprinklers and hand-moved lateral lines which are all pressured by gravity flow. Two Creek Ranch’s irrigation water rights are solid and sufficient to weather the occasional dry years which come in the West. Neighbors have admired the crop production and condition of livestock on this ranch for many years. Many consider it to be the premier place in the Valley. 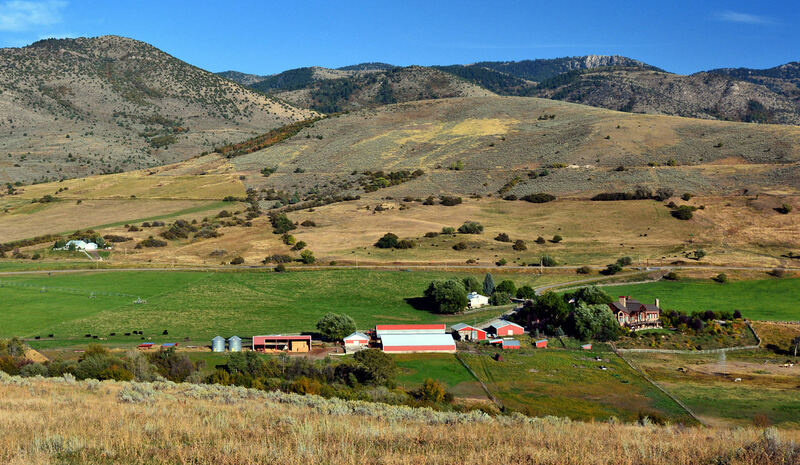 The Seller will convey with Two Creek Ranch 100% of whatever mineral, oil, gas, geo-thermal, hydro-carbon and gravel rights which they actually own, subject to reservations by previous owners. They make no representation as to the quantity or quality of any mineral or other subsurface rights appurtenant to the Ranch. 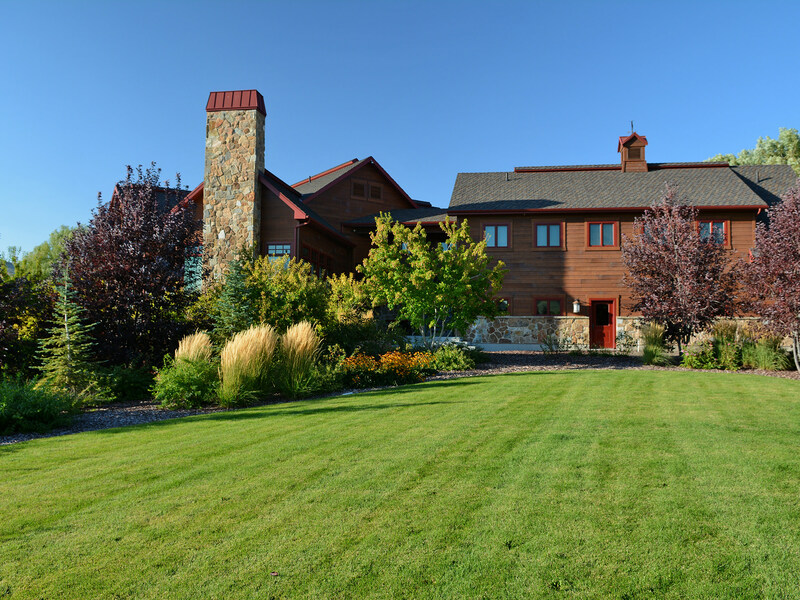 The Ranch is serviced by Rocky Mountain Power. The owner’s home has a back-up propane-powered generator that turns on automatically if the main power fails for any reason. There are six 1,000 gallon propane tanks buried near the generator building that serve the owner’s home. The manager’s home is also served by a 1,000 gallon propane tank. All propane tanks on the Ranch are owned, not leased. Telephone and internet service are provided by Century Link. Both homes are served by the Mink Creek Culinary Water System, and have septic sewer systems. Property taxes for 2018 were approximately $16,900.00. In 1873 Mink Creek was established as a Mormon colony about two years after Janus Keller and his three sons built a log cabin on nearby Strawberry Creek, just north of the present village. The four Kellers scythed the lush native meadow hay for their cattle and horses the first summer. Then Janus left two sons, ages twelve and fourteen, to look after their homestead claim, and returned to the rest of the family and his farm 60 miles south in Utah Territory. The twelve year-old became homesick and walked home; the older brother spent the winter alone, looking after the small place and the livestock. In April of 1874, his mother and the rest of the family arrived and established themselves permanently. Other Mormon families soon moved to the Valley. Grain fields were harvested with scythes, sheaves were bound by hand, and threshed with flails. Native meadow hay was cut by horse-drawn mowers wherever the land was level enough. In 1878 the first post office and two schools were opened. At one time Mink Creek’s population reached 500 and then dwindled to about 250 people. School children have been bussed down to Preston since 1965. Buyers’ Brokers are welcomed and invited to contact Sam Sanders in our Salt Lake City Office for information regarding Cooperation Policies.